Do You Know Virtual Data Center? Data centers are important to our daily life and work. However, in traditional data centers, engineers are struggling with the need to use multiple tools to maintain the data center management, like provisioning, managing and monitoring server, which is complex, expensive, inefficient and labor-intensive. Is there any better method to solve those problems and improve data center? The answer is virtualization. A modern data center is considered to be the future of the data center, which is known as virtual data center. What Is Virtual Data Center? A traditional data center is built by adding more compute, more storage and more networking, while a virtual data center is a data center that operates using virtualization technology which partitions a single physical server into multiple operating systems and applications, thereby emulating multiple servers, known as virtual machines (VMs). In other words, in a virtual data center all the infrastructure is virtualized and the control of the hardware configuration is automated through intelligent software system. This is the largest difference between the traditional and virtual data centers as well as one of the outstanding advantages of virtual data center. As mentioned that data center virtualization is considered as the trend of the future data center. But what can virtual data center provide? What’s the advantages of virtual data center compared with the traditional one? The main abilities and advantages of virtual data center are illustrated in this part. Cost Saving: it is known that hardware is usually the highest cost in data center. The development of the traditional data center depends on hardware and storage. Except the cost of hardware, the management and maintenance of the hardware are largely depend on labor operation of which the cost would go well beyond that of hardware. Thus, with virtual data center, the costs would be cut largely. Easier Management and Maintenance: in traditional data center, things like heat dissipation, physical server, data backup and testing should be considered. And a lot of labor work and money has gone into these part of daily management and maintenance. Virtualize the servers using less physical hardware, less heat would be generated. The backup steps would be much easier in a virtual data center operated by software. Both full backups and snapshots of the virtual server and virtual machines can be done and these VMs can be moved from one server to another easier and faster. As to testing, with virtual data center the testing environments can be isolated from end users while keeping them online. When you’ve perfected your work, deploy it as live. Faster Recovery: if the a physical server dies, the redeployment might need a lot of time. However, with virtualization, the redeploy can occur within minutes with just a few clicks. Facing disaster, if the data center is virtualized, with up-to-date snapshots of your VMs, you can quickly get back up and running. With virtual data center, a host of issues go away. Closer to Cloud: with virtual machines, you will be closer to enjoying a Cloud environment. You may even reach the point where you can deploy VMs to and from your data center to create a powerful cloud-based infrastructure. But beyond the actual virtual machines, that virtualization technology gets you closer to a cloud-based mindset, making the migration all the more easy. These outstanding benefits are the main factors that drive the trend of data center to virtualization. However, to take full advantages of the virtual data center, many challenges are ahead, like security, allocating resources, maximizing investments in infrastructure. One of the most conspicuous challenges is bandwidth. As mentioned, virtual data center is automated through intelligent software system, which need the support of high bandwidth. Currently 10 Gigabit Ethernet (GbE) is now being widely adopted which could be a good choice for a storage access network. However, there might be potential blocks in the journey to virtual data center with 10GbE. To fully realized the benefits of a virtualized environment, the implementation for 40/100 GbE is recommended as the first step to virtualization. Currently, more vendors are supplying solutions for 40/100GbE. The cost of 40/100GbE is decreasing in a foreseen future. The increased traction of 40/100GbE has led to its best practice status as the standard for the next generation of high-bandwidth virtualized application. The trend of the data center virtualization is clear with great benefits and potential application that virtual data center can bring to us. 40/100GbE is just the first step of the journey to virtual data center, barriers like security and resources are there to be broken down. This entry was posted in Fiber Optic Transmission, Network Solutions and tagged 40/100 GbE, Cloud, data center, virtual data center on November 28, 2015 by Alice Gui. FTTH (Fiber to the Home) network connects a large number of end users to a central point known as an access node to provide the application and services of high speed. The links between end users and access node are achieved largely by fiber optic cables. Loose buffer cables and tight buffer cables are commonly used to transmit signals with high speed, which are capable of surviving outdoor environment or indoor environment. However, to accomplish the whole transmission link, loose buffer cables for outdoor application should be connected with the tight buffer cables for indoor application. The splicing and termination of these fiber optic cables come as one of the largest link items in a FTTH system installation budget. Is There A Better FTTH Cable Solution? Is there a cost-effective and time-saving solution by using a single type of cable that can survive both indoor and outdoor environment in FTTH network? The answer is YES. Tight buffer indoor/outdoor cable is such a cable. It is a specially designed tight buffer cable which can answer the market call for a single type cable surviving both indoor and outdoor environment. To understand why it is a better choice for FTTH installation, the construction and comparison of loose tube cable and tight buffer cable will be introduced firstly. The “buffer” previously mentioned in “loose buffered” and “tight buffer” is actually a basic component of fiber optic cable and the first layer used to define the type of cable construction. A typical fiber optic cable consists of the optical fiber, buffer, strength members and an outer protective jacket (as showed in the following picture). The buffer literally is used to provide protection and some tensile strength, which are useful when pulling the cable to install it or when it must hang between two suspension points. Loose buffer cable consists of a buffer layer that has an inner diameter much larger than the diameter of the fiber (showed in the following picture). Thus, the cable will be subject to temperature extremes that cause expansion or contraction. That’s why loose buffered cable are usually used outdoor. The loose buffer cables designed for FTTH outdoor application are usually loose-tube gel-filled cables (LTGF cable). This type of cable is filled with a gel that displaces or blocks water and prevents it from penetrating or getting into the cable. Tight buffer cable using a buffer attached to the fiber coating is generally smaller in diameter than loose buffer cable (showed in the following picture). The minimum bend radius of a tight buffer cable is typically smaller than a comparable loose buffer cable. Thus tight buffer cable is usually used in indoor application. Tight buffered indoor/outdoor cable with properly designed and manufactured can meet both indoor and outdoor application requirements. It?combines the design requirements of traditional indoor cable and adds moisture protection and sunlight-resistant function to meet the standards for outdoor use. Tight buffered indoor/outdoor cable?also meets one or more of the code requirements for flame-spread resistance and smoke generation. The structure and performance advantages of tight buffer indoor/outdoor cable have been introduced above. How about the other advantages? The following will explain why tight buffered indoor/outdoor cable is a better FTTH cable solution from the aspects of cost and reliability. Using the traditional choice of LTGF cables as the outdoor cable, there would be a conversion from one fiber type from another type, which includes prep work on the fiber, the need for splice tray, the routing of fibers in the tray, and other similar detail. Before termination and splicing, the gel of LTGF cable must be cleaned and the breakout point of the main cable must be blocked by some method to prevent oozing of the cable gel. In addition, this cable type must normally be terminated or spliced close to the cable entryway of a building to switch to indoor cable, as it generally incompatible with indoor fiber codes. This time consuming and labor intensive process adds hidden costs to install the LTGF cables. However, using only tight buffer indoor/outdoor cable for FTTH is much more convenient and cost-effective. A tight-buffered indoor/outdoor cable can be used throughout the link, requiring no transitions at the building entryway. Tight buffer indoor/outdoor cable requires less care to avoid damaging fibers when stripping back the cable. The termination and splicing of these cables are easier than that of LTGF cables. An important reason why choose tight-buffered indoor/outdoor cable for FTTH cable installation is the reliability of the overall system. Splicing are the weakest point in a FTTH network. With splicing, the bare fiber ends are open to dust, dirt, water, vapor, and handing which might reduce the fiber strength and increase brittleness. Choosing loose tube outdoor cable for FTTH, there will be splices after the conversion from one cable type to another type. The splices inside a building may be held in a cabinet that is open to the air, which might decrease the reliability of the FTTH network. Using the tight buffer indoor/outdoor cable could eliminate splicing and improve the installation reliability greatly. In conclusion, the benefits of tight buffer indoor/outdoor cable are clear. The installer can run a single cable type and remove a transition point between the outside plant and the inside plant, which decrease FTTH installation cost and time effectively. At the same time, the reliability of the overall FTTH network can be increased greatly. This entry was posted in Fiber Optic Cable, Fiber Optic Transmission and tagged FTTH, loose tube cable, splicing, tight buffer indoor/outdoor cable, tight buffered cable on November 23, 2015 by Alice Gui. Parallel optic represents a type of optical communication technology as well as the devices on either end of the link that transmit and receive information which are also known as parallel optical transceivers. Compared with traditional optical communication, parallel optic communication employs a different cabling structure for signal transmitting aiming at high-data transmission for short reach multimode fibers that are less than 300 meters. Traditional fiber optic transceivers cannot satisfy the increasing demand for high speed transmission, like 40GbE, while parallel optics technology can be a cost effective solution for 40/100GbE transmission. Comparison between parallel optic technology and the traditional serial optical communication would better explain what parallel optic is and the reason why it is a cost effective solution to high data rate transmission. The following of this article will offer the comparison between the two optical communication technology from two aspects: connectivity method and key components. Literally, parallel optics and serial optics transmit signals in different ways. In traditional serial optical communication, on each end of the link, there are one transmitter and one receiver. For example, the transmitter on End A communicates to the receiver on End B, sending a single stream of data over a single optical fiber. And a separate fiber is connected between the transmitter on End B and the receiver on End A. In this way, a duplex channel is achieved by two fibers. While in parallel optic communication, duplex transmission is achieved in a different way. A signal is transmitted and received through multiple paths, thus, the parallel optical communication can support higher data rate than the traditional optical communication. This is because, the devices for parallel optic communication on either end of the link contain multiple transmitters and receivers. For instance, in 2010 IEEE 802.3ba approved the 40GBASE-SR4 physical-medium-dependent multimode parallel optical solution, which uses eight fibers to transmit four duplex channels each at 10 Gigabit Ethernet. In this case, four 10Gbps transmitters on End A communicate with four 10Gbps receivers on End B, spreading a single stream of data over four optical fibers at a total data rate of 40Gbps. The parallel optical communication transmitting signals over multiple fibers, which has great advantages over traditional serial optical communication. It also means that it requires different components to support its high data rate transmission. Connector: As previously mentioned, duplex transmission in serial optical communication uses 2-fiber duplex connectors, like duplex LC connectors to link the optics with other devices, while in parallel optical communication, multi-fibers are used to reach a higher data rate. 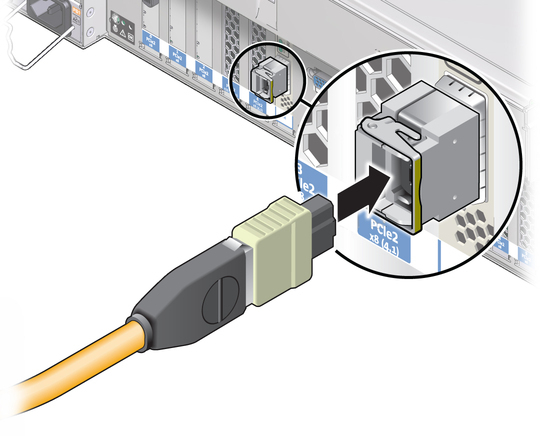 Thus, multi-fiber connectors, like 12-fiber MPO connectors are used to connect with other devices. MPO connector is one key technology support parallel optical communication. This connectivity method is showed in the following picture? (Tx stands for transmit; Rx stands for receive). Optical transceiver light source: Another complementary technology for parallel transmission is the light source of parallel optics—VCSELs (Vertical Cavity Surface Emission Lasers). Comparing with the edge-emitting semiconductor lasers in the traditional optics, VCSELs have better formed optical output which enables them to couple that energy into optical fibers more efficiently. In addition, VCSELs emit from the top surface, they may be tested while they are part of a large production batch (wafer), before they are cut into individual devices, which dramatically lowers the cost of the lasers. The following chart is about the comparison between VCSELs and edge-emitting semiconductor lasers. Cheaper to manufacture, easier to test, less electrical current required, supporting higher data rate, parallel optics using VCSELs could be a better choice to reach 40/100GbE transmission compared with traditional serial optics. IEEE has already included physical layer specifications and management parameters for 40Gbps and 100Gbps operation over fiber optic cable. 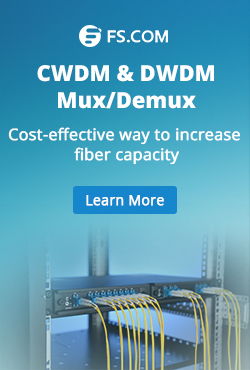 Two popular parallel optic solutions for 40Gbps and 100Gbps over multimode fibers are introduced here. 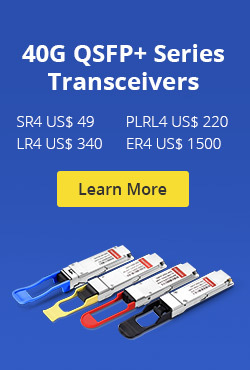 For 40G, 40GBASE-SR4 transceiver is usually used, which requires a minimum of eight OM3/OM4 fibers for a transmit and receive link (4 fibers for Tx and 4 fibers for Rx). 100GBASE-SR10 transceiver is for 100Gbps transmission, which requires a minimum of 20 OM3/OM4 fibers for a Tx/Rx link, 10 fibers are used for Tx and the other 10 are for Rx. The capabilities and uses of parallel optic and MPO technology continue to evolve and take shape as higher-speed fiber optic transmission, including 40/100GbE. It is uncertain that parallel optical communication would be the trend in the future. However, many cabling and network experts have pointed out that parallel optical communication supported with MPO technology is currently a way to equip an environment well prepared for the 40/100GbE transmission. 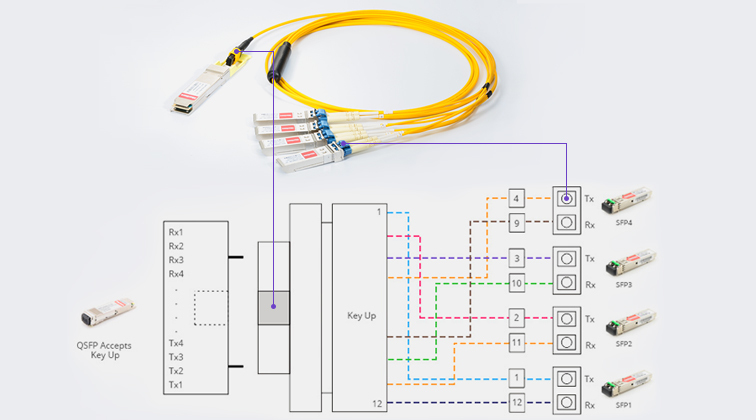 This entry was posted in Fiber Optic Transmission, Network Solutions, Optical Transceiver Solution and tagged 100GBASE-SR10, 40/100GbE, 40GBASE-SR4, parallel optic, parallel transceiver on November 9, 2015 by Alice Gui.